The Aspens at Eagles Nest in Silverthorne Colorado Real Estate are located near the Raven at Three Peaks Golf Course. Built between 1993 – 1997, these single family residences are situated on anywhere from 0.14 – 0.43 acres. There are a total of 50 properties in The Aspens at Eagles Nest comprised of 14 – two bedrooms, 32 – three bedrooms and 4 – four bedroom residences. Each property comes with either a 1, 2 or 3-car garage. 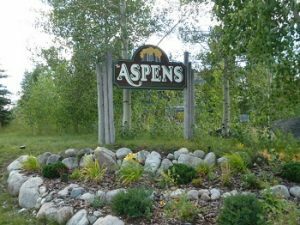 All the homes in The Aspens at Eagles Nest are located on either Blue Grouse Lane or Chipmunk Lane in the sought after Eagles Nest subdivision in Silverthorne Colorado. The homeowners association for The Aspens at Eagles Nest does charge owners $210 per month. Included in the monthly fees is snow removal for driveways, landscaping outside of the fenced perimeter (your backyard is your responsibility), and staining of the fences and the home exteriors every 4 years. Aspens at Eagles Nest has great views of the Gore Range. If you purchase a property in Silverthorne or Aspens at Eagles Nest you are a short drive to Interstate 70 to get back to Denver or the airport. Aspens at Eagles Nest homes are a great way to get into the Silverthorne Real Estate market. Contact Justin and Krystal Knott with LIV Sotheby’s International Realty to start your search for a condo or home for sale in Silverthorne CO Real Estate.